It might be a little early to be thinking about your Christmas Tree, but here's a little tip for its decorations. Before the craziness of the holiday season finds you, how 'bout collecting some bike parts you no longer need and reuse them as ornaments. You can use cogs or pieces of chain. You can also use race medals and race numbers to make your tree look great and reflect your cycling lifestyle. So don't trash those things -Bicycle Re-Cycle them! Skeese Greets is part of the Bicycle Re-Cycle Green Team in Austin, TX. 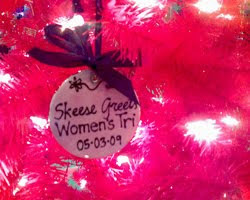 Pictured here is a pink tree with a Skeese Greets Tri award. This tip was included in the October 2009 Skeese Greets Monthly Newsletter. Click HERE to sign up!